Did you know that across the US, 1 in 10 people suffer from diabetes? Data from the National Diabetes Report shows 29 million Americans have diabetes and another 86 million adults are at increased risk of developing the disease. These are staggering figures. For those facing the condition, one of the first questions that pop to mind is: ”Can I drink alcohol?” And considering alcohol and blood sugar relate on many levels, the answer to this question needs to be approached carefully. American Diabetes Association claims diabetics who have their blood sugar under control are allowed to drink in moderation. It can be beneficial to their health. It goes without saying though, that the doctor’s guidance is crucial in these instances. Here are some facts about diabetes and alcohol consumption. How Does Alcohol Affect Blood Sugar Regulation? What are the Dangers of Alcohol Abuse and Diabetes? What is the Beneficial Effect Of Alcohol In Moderation? There’s no need for people with diabetes to completely give up on alcohol. However, diabetes and alcohol in excess don’t mix well. This is because people with this condition have a hormonal defect wherein their insulin levels are too low. Insulin is in charge of converting glucose from food to cellular energy that fuels us. If there is a lack of insulin in the bloodstream, there is also excess glucose in the system. Thus alcohol affects the body. Over time, high glucose levels damage all major organs in the body, including the kidneys, heart, and eyes. Those who don’t maintain their glucose levels are at an increased risk of developing severe diseases and conditions related to organ damage. In the very worst cases, patients may suffer from strokes, nerve damage, cardiovascular diseases, blindness, gout, kidney failure, and even alcohol-related death. Unfortunately, as of yet, there is no cure for diabetes. What patients can do is maintain the disease. Before considering how alcohol and diabetes interact, we need to understand the different types of the disease. Most people have heard about the type I or II diabetes, but what does that actually mean? These two major types are life-long conditions affecting the body’s ability to use the energy from food. Type I diabetes is the less common but more serious form of the condition. This autoimmune disease is your own body attacking its pancreas (concerned with blood sugar regulation) with antibodies, resulting in the inability to produce insulin. It most often begins in childhood and the treatment includes injecting insulin frequently. Dieting and exercise also play an important role in maintaining type I diabetes. Type II diabetes is the more common type, accounting for some 95% of the cases. It either happens when your body does not produce enough insulin or cannot make use of the hormone properly. Its causes are either be genetic or spurred by lifestyle factors such as physical inactivity or obesity. Unfortunately, type II diabetes, albeit less severe than type I, tends to progress and worsen. The best patients can hope for is to control its effects. Type II diabetes doesn’t happen overnight. According to researchers from the Harvard Medical School, most people display warning signs before developing the illness. 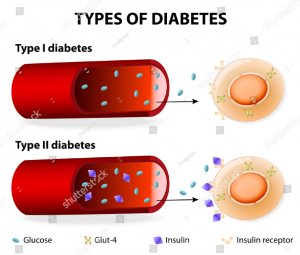 They are at what’s called the pre-diabetic stage, with their glucose levels higher than normal but not as bad as to be classed diabetic. For millions of Americans facing prediabetes, these high blood sugar levels act as a wake-up call to turn things around. Although the underlying causes of the disease are most commonly of biological nature, we can conclude that alcoholism certainly contributes to the risk of developing the disease. By lowering the body’s sensitivity to insulin, alcoholics are at an increased risk of developing type II diabetes. Moreover, those who drink without limit have a higher chance of increasing body weight and developing obesity, the primary causes of type II diabetes. Finally, heavy drinkers tend to develop chronic pancreatitis, which tends to, in turn, cause diabetes type II. Can Alcohol Affect Blood Sugar Levels? Every diabetic or pre-diabetic person knows how important regulation of their blood sugar level is. Too much alcohol can make this task very difficult to accomplish. So how does alcohol affect blood sugar level? Alcoholic drinks such as beer, wine, cordials, mixers, and ciders contain a lot of carbohydrates which can skyrocket blood sugar levels. Some alcoholic drinks, beer, for example, are extremely calorie-rich. Ever heard of a beer belly? Well, the last thing a diabetic person wants is to become obese or overweight. Alcohol is also an appetite stimulant. That’s why apéritifs are served before dinner in restaurants. Diabetic people who often drink may find themselves craving food quite frequently. Does alcohol lower blood sugar level? Yes, in cases of excessive drinking. This is more common for those with a type I diabetes. Finally, a diabetic person who drinks too much may have impaired judgment. He or she may choose to consume the food that they should avoid. Now that we understand how and why does alcohol lower blood sugar level, we can talk about the implications this habit, if uncontrolled, bring along. Diabetics should pay extra attention to the amount of alcohol they consume – women shouldn’t exceed a single drink per day while men with diabetes are advised no more than two drinks. Breaching this rule and drinking uncontrollably can lead to a plethora of dangerous conditions. 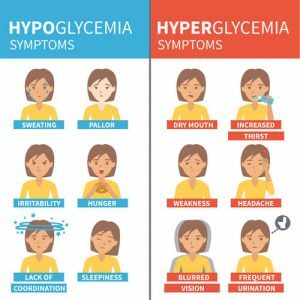 For example, if a diabetic person’s blood sugar drops below normal levels due to alcohol abuse, he or she could develop hypoglycemia – also known as insulin reaction. This condition is marked by nervousness, shakiness, sweating, drowsiness, dizziness, and confusion. If not treated with glucose promptly, the condition could lead to fainting or even diabetic coma. On the other end of the spectrum, if one’s blood sugar level is too high, we talk about hypertension. In such cases, the patient will experience chronically high blood pressure which strains the heart and damages the blood vessels, thus increasing the risk of stroke, heart disease, and kidney failure. Excessive drinking in these conditions could contribute to high blood pressure and amplify the associated dangers. 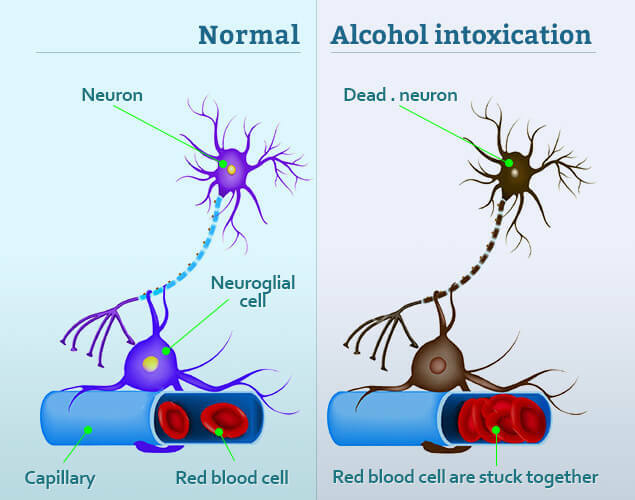 In addition to all this, alcohol abuse is notoriously able to provoke nerve damage, even in healthy people. Those afflicted by chronic diabetes are then subject to an increased risk of developing diabetic neuropathy – a condition wherein patients suffer from pain, numbness, and burning or tingling sensations all over. Research has found those who enjoy regular tipple have less chance of developing heart disease. Now, additional studies have come to light, showing those suffering can benefit from diabetes and alcohol consumption in moderation. This, of course, only works if one’s blood sugar levels are under control and they don’t have high blood pressure or other conditions that may be worsened by alcohol consumption. Women with type II diabetes who enjoy an occasional drink have lower chances of developing heart diseases than those who do not drink at all. Compared with non-drinkers and heavy drinkers, those who drink moderately have a 30 percent less chance of developing type II diabetes in the first place. Diabetic men who drink in moderation also have a reduced risk of heart disease. If a person doesn’t follow other heart-friendly practices and eats unhealthy food, smokes, or doesn’t exercise, alcohol will have very little positive effects on their condition. It is important to have in mind, though, that these findings only apply to moderate, infrequent alcohol consumption. If a person drinks more than is considered moderate, the habit will negatively affect their condition. Asking one’s doctor about the safe limit for alcohol and diabetes is the best approach one can have. There are always other ways of reducing the risk of heart disease by following other practices. One drink equals to 5 ounces of wine, 12 ounces of beer, or 1.5 ounces of distilled spirits and hard liquor. Keep away from carbohydrate-rich beverages. Some of the most popular include craft beers, ciders, mixers such as vodka and orange juice, etc. Those on a calorie-restricted diet should never count their drink like a meal. A diabetic person should never drink on an empty stomach or when his or her glucose levels are down. Alcohol can lower blood sugar level and put them at risk. Rather, having a drink alongside a meal is a much safer option. In most cases. Diabetics should make it a priority to consume food low in calories. Same goes with alcohol. Light beer and dry wine in moderation and they’re in the clear. On an evening out, a diabetic could choose to switch to non-alcoholic drinks after the first two drinks. Before having a drink, a diabetic person should measure their blood glucose to prevent hypoglycemia. Also, wearing medical ID jewelry will help paramedics know your hypoglycemic instead of drunk in case your blood sugar falls dangerously low. Take a leaf out of Martha’s Book. Martha has had type II diabetes for over a decade now. She hasn’t given up drinking, though – she loves her gin too much to become a teetotaler! However, she ensures she keeps her blood sugar levels in check and drinks no more than a drink per day. She makes sure there are no sugary mixers or foods in her home. This way, even if she craves sweets and snacks or wants to add a sugary kick to her drink, she can’t. Also, on a night out, she loads her phone with reminders which alert her not to drink more than one serving or have too many calorie-rich foods. Having a type I or II diabetes can be an enormous challenge. Keeping your blood sugar levels under control means giving up on many of the things you used to enjoy. Alcohol, however, doesn’t have to be one of them. As long as you stick to the above-mentioned rules alcohol and diabetes don’t have to be enemies, on the contrary, you may even reap some health benefits. Keeping one’s drinking habits at a minimum, sticking to a healthy diet and exercising often are the best methods of maintaining diabetes and leading a healthy lifestyle. There are many alcoholism treatment programs specifically created for people with diabetes which meet all the needs and requirements of patients with such comorbid disorder. Alcohol addiction support groups are also helpful in preventing relapse. The alcohol addiction treatment center will help to cope with the substance dependence problem.